Here is the latest list of winners! Congrats to all of you! 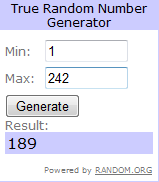 Congrats to all the winner and good luck to everyone in future giveaways! Stopping by from FF, but I'm already following you on gfc. Also wanted to invite you to join our blog hop, Feed Me Friday. Hope you'll stop by and link up!